Eight featured slideshows that are as distinctive as the artists themselves... One photographer used this medium to bring his heritage to life, while others relived vacations or captured the rhythm of everyday events. One entrant created a movie to promote his photography studio. Still others shared life's drama, such as a balmy evening of boxing in Texas, or a garage band's road to local fame. These are just a few of life's tales vividly captured in the entries featured in the FotoMagico Slideshow Showcase. You can watch each of these presentations, read about the techniques and software the artists used, and consider if any of these approaches might help you better share your images with the world. So sit back, turn up your speakers, and take a trip to the movies, digital story style. 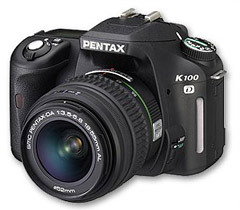 Pentax's new K100D DSLR is compatible with any lens that Pentax has ever produced. This is intriguing news for fans of the traditional Pentax K1000, which was the outrageously popular camera for beginning photographers during the 1980s. In your closet right now you might have the components to build a formidable digital system. 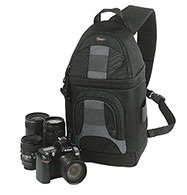 The Pentax K100D is an affordable ($699 with 18-55mm lens) 6.1 megapixel DSLR featuring shake reduction technology, 11-point auto focus, 2.5" LCD, and a stainless-steel chassis that is built to last (much in the same way its predecessor the K-1000 stood the test of time). If you have Pentax lenses stashed away, you might want to further investigate this camera. It's a handsome body with plenty of modern bells and whistles that enables you to use some of your favorite glass from the past. Nice move Pentax! One of the things I like about my older Canon PowerShot G2 is that is supports Raw as well as Jpeg. This used to be common with advanced amateur models such as the G1 and G2, but these days you often have to buy a digital SLR to get Raw support. I guess this is the modern version of nostalgia -- I really enjoy grabbing the G2 (it has a very smart custom leather case like cameras of yesteryear) on my way out the door, knowing that I have a fast f-2 lens, full manual controls, vari-angle LCD screen, hot shoe, and yes, Raw format. 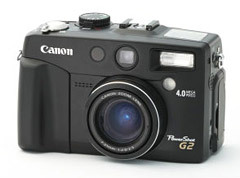 It even uses the same batteries as my state of the art Canon 5D DSLR. When I return home, I can process my 4-megapixel Raw files with the beta 3 version of Lightroom. And they look great. It's old meets new. And it's a lot of fun. Here's a new thing to do with your compact camera: hold a peephole viewer to the front lens for "do it yourself" fisheye view of the world. (Peephole viewers are available at any hardware store for cheap.) The creative folks at Make Magazine demonstrate their spin on the concept based on a paper by H. G. Dietz at the University of Kentucky. The Make Magazine version is simple. 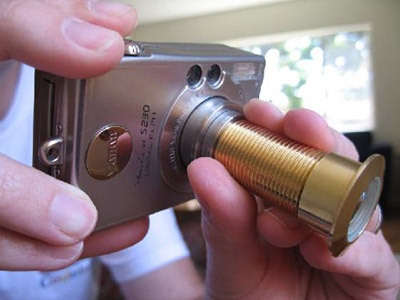 Hold the peephole viewer in place and take a picture. This gives you a superwide view of the world. (Thanks to Phil and the crew for posting this cool idea.) Mr. Dietz goes into more detail about this technique and discusses mounting the viewer on a variety of cameras. If you want to go the other direction and create a super-telephoto for your compact, take a look at our earlier post on digiscoping. I've been testing the new Adobe Lightroom Public Beta 3 on a new Intel MacBook Pro and am impressed with the application's performance. There are also many UI refinements from Beta 2, including a new module: Web. That's where I started experimenting. The Web templates are quite attractive, although you don't have much flexibility with them yet. There are 3 presets -- HTML gallery, Exif metadata, and Flash gallery. You have two options for exporting: Save to your hard drive or upload to your web server. You can enter your FTP settings directly in Lightroom saving you a couple steps. The Develop module also received some attention. You now have additional tools above the filmstrip -- most notably a Before/After view, which is really handy while image editing. There are RGB value readouts too. A member from The Digital Story community, Jeremey Barrett, has published first impressions of Beta 3 on his weblog. You might want to take a look. One final note: still no official word on the Windows version yet. For now, the beta is only Mac. But you can sign up to be notified as soon as the Windows beta is ready. If you're in the mood for a little photo amusement, give BeLight's Image Tricks a spin. This Universal Binary application (that's absolutely free) works on both PowerPC and Intel-based Macs running OS X. It taps the power of Core Image to arm you with an array of special effects for your photos. 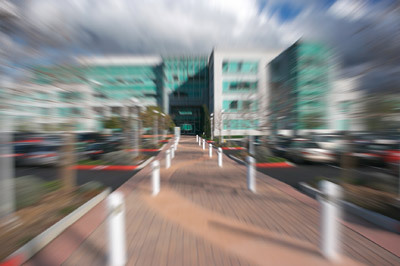 I applied the "zoom blur" effect to this image capture in Silicon Valley. The effect transformed a pleasant, but not exceptional photo, into something far more dynamic. I could have selected from any number of transformations, including bump distortion, circular splash, glass distortion, and more. Plus I have nuts and bolts adjustments such as unsharp mask, exposure, gamma, hue, white point, monochrome, and others. There's even a nifty cropping tool and image resizer. If all of that isn't enough, I can also use the image generator to create my own patterns for backgrounds and textures. Some of the most interesting ones require an upgrade to the Pro version, but that's still only $9.95. Image Tricks is a terrific tool for creating new looks for your old pictures. Yes, you can use it as a standard image editor, but its real charm is how it encourages the child that just wants to play. Here's an interesting camera for summer activities: the Olympus Stylus 720 SW. 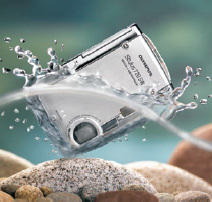 This very pocketable point and shoot is immerse-able in water as deep as 10' for as long as an hour. And it can take a licking too -- up to a 5' drop -- and still keep taking pictures. On top of that, it's kind of cute. If you're looking for a tough little camera that can survive the rigors of summer activities, you might want to take a closer look. The 720 SW has a 7.1 MP sensor, 2.5" LCD monitor, 3X optical zoom, 28 preset shooting modes, uses xD-Picture Card, has 19.1 MB of internal memory that lets you shoot even when your media card is full, and comes with a Li-Ion rechargeable battery and charger. The 720 SW has ISO settings for 64, 100, 200, 400, 800, and 1600, but I don't recommend going above 400 except when absolutely necessary to get the shot. You can capture video and sound with the QuickTime movie mode at a maximum quality of 640x480 at 15 fps. The Olympus Stylus 720 SW is available online at Amazon for about $360. I often refer to The Digital Story as a virtual camera club. Indeed, an online meeting place for the exchange of ideas is a beautiful thing, and I know many of you agree. But there are times when working face to face in an exotic location is the ultimate photography experience. I have such an opportunity coming up at the end of October, and you can join me if you wish. I've put together a digital photography workshop with my friend Ben Long, and we're taking it on the high seas to the Western Caribbean. This Geek Cruise (Oct. 28 - Nov. 4, 2006) features stops in Key West, Florida; Belize City, Belize; Sano Tomoas De Castillo, Guatemala; and Cozumel, Mexico. The sailing begins and ends in Tampa, Florida. What's extra special about this trip is that we have a full-fledged photography workshop included in the trip. Here's a quick overview of the topics we'll cover. We have three instructors for this week-long workshop: writer, photographer Ben Long, Macworld Magazine editor Kelly Turner, and myself, Derrick Story. We've integrated the workshop with the days in port to provide a full-bodied photography adventure. While at sea, we get together in classrooms and learn techniques in preparation for our excursions in the Western Caribbean. Then, when we return to the ship, we compare our experiences, fine tune our techniques, and prepare for the next adventure. We'll even have open camera clinics where you can ask any question and have us help you with your equipment. Members of the Digital Story audience will receive signed photo books by me. I'll also have a special "The Digital Story" birds of a feather session where we can get together to meet one another and talk about grab shots, photo assignments, and other virtual camera club topics. I think this will be tons of fun. If you're interested in a late-season photo vacation this year, take a look at the Geek Cruise home page for complete information about the trip, the photo workshop, and the other sessions offered on this cruise. 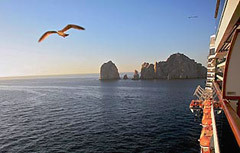 As a tempting teaser, you might want to peek at some of my photos from the Mexico cruise. You'll see a mix of location shots combined with the images from ship life while at sea. It's a powerful experience.